Growing up in Georgia, I didn’t know there was such a thing as being able to live without a car. Georgia is just a car culture… as are most places, other than highly-developed urban areas. I had a car in Chicago until 2010 when I decided I didn’t need one anymore. And I didn’t. Chicago (along with Boston and New York) has some of the finest public transit around. And, if the trains and buses didn’t suit you, then there was a huge network of cabs at your disposal. Technology (with various apps- Bus Tracker, Uber, etc.) made public transit and cabbing even MORE convenient… and for those times when you really needed a car, Chicago also had a great car SHARING service-you read that right- of which I belonged. California, however, is most definitely a car culture. And, although the city of Los Angeles ALSO has a public transit system, it’s layout isn’t as conducive for Jojo and I and our future plans. Like Marta in Atlanta, I’m sure it works great for SOME lucky people… but Jojo and I knew that we were going to need to get a car soon after our arrival in Cali. As I mentioned, I’ve had a car since I was 16. Jojo on the other hand, has not had a car SINCE he was 18. He went to college in Chicago and never really had the need for one. So the prospect of buying a car (in addition to starting a new job and moving to a new state) was really stressing him out. High-pressured sales tactics are probably Josh’s least favorite thing- other than vegetables– So, when it came to buying a car, I suggested CarMax. It is a 2011 model with 31,000 miles on it that was previously in a rental car fleet in Hawaii. As Josh was born in Hawaii, that seemed like a good omen. And although we were pleased with our decision, we were even more tickled when a friend of our sent us this article on the “10 Cheapest Cars to Own” with the Nissan Versa topping the list. We were even more clever than we knew! So far, so great! 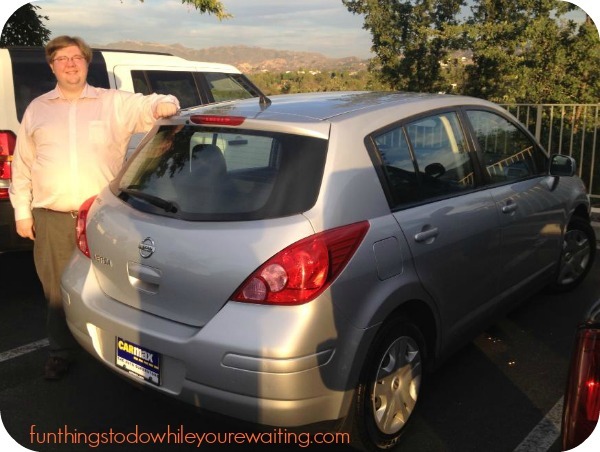 It may not be a schmancy luxury car, but for Josh’s first-car-ever, it fits the bill. As my budget isn’t as vast as Josh’s, I have been cruising Craigslist recently looking for a car and the uncertainty of the market is terrifying. As soon as I get a real job, guess where I’m going? Have you been to CarMax? What was YOUR experience? As always, let us know! My Kind of Town: Top 12 Things To Do in Chicago in 2013 And… We’re Here! Fun Things To Do While You’re… MOVING?! Previous Article← Black Bean and Corn Salsa: Heaven in your Mouth! Buying a car is way fun! I would grammar check your blog and then forward it to CarMax. You might get compensated. Maybe they would forward people to FTTDWYW. I read somewhere that Jared of subway is worth 15 million and still works for subway 15 years later.